You can separate a sound clip into two sound clips, allowing you to cue different parts of the same sound sample at different points in the timeline. TIP It is easier to edit sound clips with their waveform displaying in the Timeline view—see Displaying Waveforms. In the Timeline view, select the sound clip you want to split. 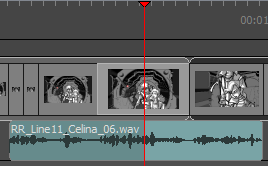 Move the timeline cursor to the frame at which you want to split the clip. In the Timeline view, right-click anywhere on the audio track and select Split Clip at Current Frame. The sound clip is split. You can now move both parts independently. 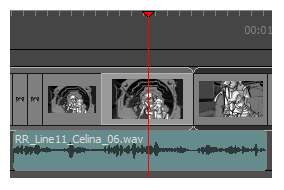 NOTE When splitting a sound clip with volume keyframes, the two resulting clips will both have all the volume keyframes the original sound clip did, but the volume keyframes outside of their respective boundaries will be hidden.